New permissive footpath goes live! Great News!! Oxton Estate has generously offered to provide a second permissive footpath in order to mark the Queen’s Diamond Jubilee year. The path will run in a westerly direction from the top of Windmill Hill around Godson’s Wood and onto Forest Road. It makes a CIRCULAR walk of approx 2.5 km starting and finishing at the Green Dragon pub. It will be named, rather aptly, “Diamond Jubilee Permissive Footpath” and the current permissive path will be renamed “Millennium Permissive Footpath”. The PC and Oxton Estate have each contributed to half of the costs for the four new signposts which will mark the start and finish of both paths. 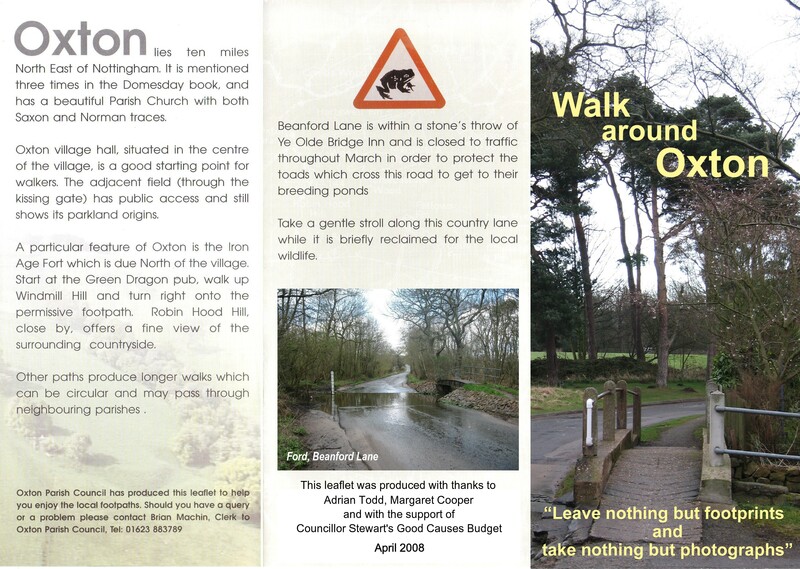 The “Walk Around Oxton” leaflet will be updated on the next print run. Current copies will be amended by hand. Thank you to Oxton Estate for such a fantastic gesture! !